Piracy is what got me into EVE. I had romantic ideas about prowling the darkness of space in my ship, spreading terror amongst merchants, mission runners, and miners; making a living robbing and ransoming others whilst establishing a bad reputation. I was told EVE online was refreshingly supportive of this lifestyle. I heard stories and rumors of the corsairs and outlaws of New Eden, shrouded in awe-inspiring infamy and dark mystery. It seems a trivial, almost embarrassing, thing now, but I still clearly remember seeing my first outlaw on the overview. It was an Apocalypse class battleship, flashing an angry red and laden with the promise of death. It was so close I could see it from my horribly fit Coercer. Courage failing miserably, my heart raced like a deer catching sight of a predator in murky woods. My fingers trembled with a surge of adrenalin and my every instinct told me to get out of there as fast as I possibly could. From the Disney-esque depictions that immediately spring to mind to the modern day Somali “coast guard.” From the bandits and desperadoes of the Wild West, to the ‘one percenter’ biker gangs of the post WWII-era. Pirates and outlaws have always enthralled our imaginations and figure endlessly in our tales, books, films, TV-shows, documentaries and games. This fascination applies tenfold in EVE online. Pirates and outlaws have roamed and ravaged in lowsec since the dawn of New Eden and created for themselves a reputation that stretches beyond even the boundaries of the EVE community itself. Strictly speaking there are pirates, with a negative security status, and outlaws, with a security status of -5.0 or less. However, in the vernacular amongst lowsec residents, outlaws are referred to as pirates. Part of the reason is that sub-zero security status has become so common. The pirates themselves can to some extent be split into two sub-groups; people with a low security status due an addiction to PvP and ‘real’ pirates that engage in underhanded activities for profit. In reality, many modern outlaws are a mix of the two. Now, more than ever, the pirate lifestyle is alive and thriving in lowsec. Since the introduction of Faction Warfare pirates find themselves with no lack of targets. But it was not always so. Back when I made my first, ill-fated, run at piracy things were quite different. Targets were harder to come by for the small-time pirate and many were struggling to make a living. It was back when belt piracy was a thing and ransoming mission runners was a lot more common. Many of the battles were met between pirates themselves and the infamous EVE learning curve made it’s presence acutely known, culling the weak at first mistake. A pirate had few friends and was regularly hunted. Some established corporations and alliances existed, but they were few and lived a hard life. On the other hand these were some of the most experienced and battle-hardened veterans New Eden had ever seen. The modern day pirate lives a significantly different life. A rejuvenated lowsec provides ideal hunting grounds and the play style has become a lot more accessible and appealing. With the militias at each other’s throats throughout the war zones the brigands often have their pick of victims. 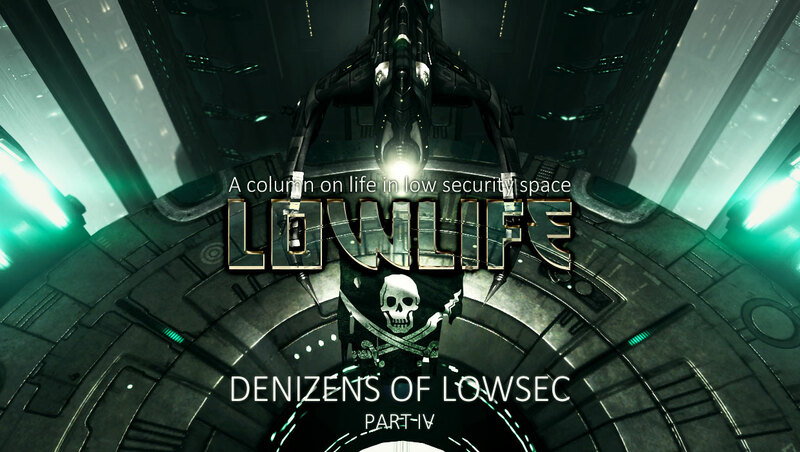 This milieu has not only changed lowsec, but to some extent the pirates themselves. The marauders of lowsec are expert small gang fighters by necessity. Given the harsh life they lead, especially those that are pre-Faction Warfare veterans, they are either very good at what they do or simply don’t last long as pirates. Unlike privateers, pirates don’t have the luxury of easy access to allies and have to trust in their corporation or alliance for support. While the militias tend to focus on cheaper ships and attrition warfare, pirates often do not shy away from spending some hard-earned cash on their vessels. Heavy assault cruisers, faction frigates, faction cruisers and assault frigates are not uncommon. Some of the more established entities deploy battleships, strategic cruisers and even capitals on a regular basis. 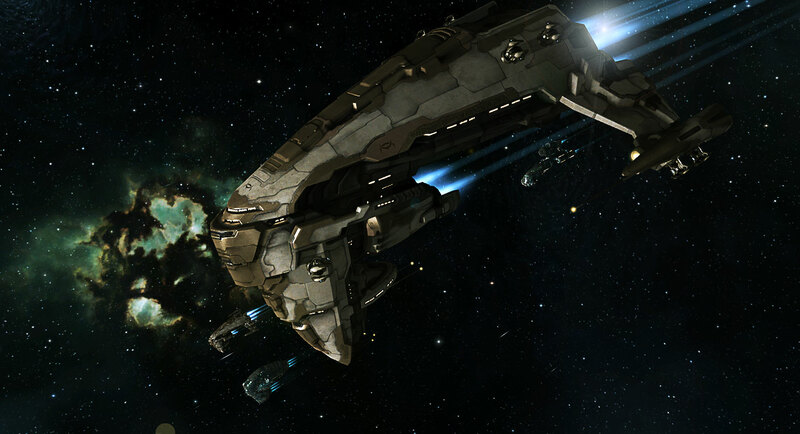 The fleets tend to be well oiled machines with capsuleers that have had each others backs through countless battles. Pirates have deep traditions in fighting dirty and unfair. Tactics developed and honed over a decade – and still very much alive. Many are experts at baiting, ransoming, gate camps, station camps, catching mission runners or explorers and similar underhanded activities. Living on the wrong side of the law is living hard. Nullsec have their natural resources, highsec have their industry, militias have their LP, but the pirate must find other ways to stay above water. Generally speaking, many use PvE as a means to fund their lawless activities. Running complexes, nullsec ratting and the like. Others keep a highsec alt and engage in industry, or, God forbid, mission running, to keep themselves in the black (in both senses). Ideally however, the true outlaw makes a living off the backs of his victims. Besides the regular booty garnered from holding the field after an engagement, or ransom paid at gunpoint, a successful pirate outfit will often use gate camps as a way of bankrolling their organization. The essential components of a successful gatecamp operation are knowing what routes to ‘tax’ and what ships to bring. As the saying goes: location, location, location. A good gate camper will know the main trade routes in their area like the back of their hand. Commonly a gate camp is placed along the direct pipe between a trade hub and the home systems of larger corporations and alliances. More often than not this will be the entry system to lowsec along that line. As anyone experienced in this form of non-consensual acquisition of items will tell you however; it’s good to move around now and then. A stationary gate camp will soon be avoided by anyone watching their channels, as well as run the risk of being attacked by a force tailored to take it out. Gate camps are also on occasion deployed further into the Faction Warfare war zones. In that incarnation they are often different in composition and geared specifically to take on combat fleets. The foundation of a gate camp is the fast lockers. On the cheap end this is often (but certainly not always) a frigate or destroyer with sensor boosters and scan resolution rigs – able to lock and warp disrupt even small ships within seconds. Some gate camps consist solely of this ship type, like the infamous cockbag Thrasher for instance. Larger gate camps will also employ heavy interdictors using targeting scripts or even strategic cruisers to fill this role. When the camping fleet has enough fast lockers to cover the whole area of a gate, proper tackle with scramblers and webs is often added along with ECM, depending on the fleet composition. This is finally topped off with dps ships able to rip apart even large targets at speed, often at long range to deter cynosural field bait tactics. A blind gate camp is an inefficient gate camp. A scout with ‘eyes’ in the system the gate of which is being camped is essential. The scout’s job is to prepare their fleet for what’s coming. A good scout will be able to tell the difference between good targets and a bait ship for instance. The camping fleet must also keep an eye out in local and on directional scan. It is well equipped to perform the task at hand, but will fare poorly against a fleet composed for combat in earnest. Although they may be loath to admit it; pirates are also dependent on the industry and trade of highsec. Goods must regularly be imported to keep pilots with the equipment they need. Much can be manufactured by salvaging loot, but some things must be brought in. Along the same lines, much of the loot picked up can also be sold back to civilized society. Logistics has been a key issue for outlaws since the birth of EVE. The ability of swiftly replenish needed goods is a key component in maintaining power in lowsec and this is especially vital for those living below the -5.0 security status line. Unlike the privateer, that has a militia logistics backbone for support, the outlaw must trust in either their corp, their alliance or themselves to solve this problem. For this reason most find it essential to have alts and at least some form of internal jump freighter service. Black Frog Logistics is always an option, but at 70 mil a pop, this is not ideal and is only used in a pinch. 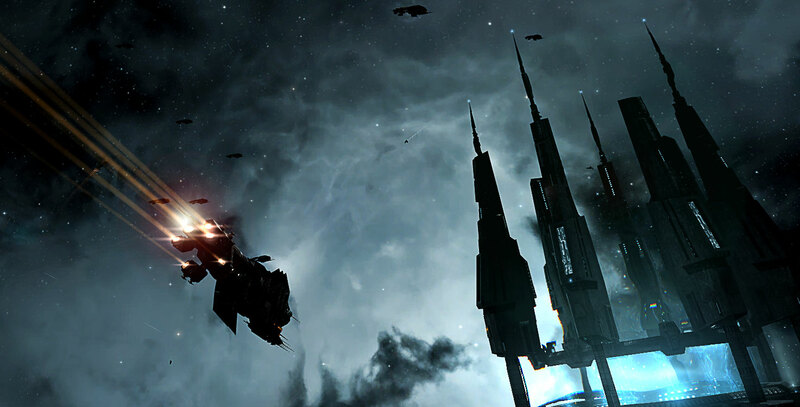 Piracy is what got me into EVE online, and even though I never became a successful pirate in my early days, it will always have a special place in my heart. For me this is at the very core of what EVE is – violent, unforgiving, thrilling and incredibly satisfying on a very personal level. In many ways the life of the outlaw is the ultimate challenge New Eden offers – to willingly declare war on the rest of the world and thrive.